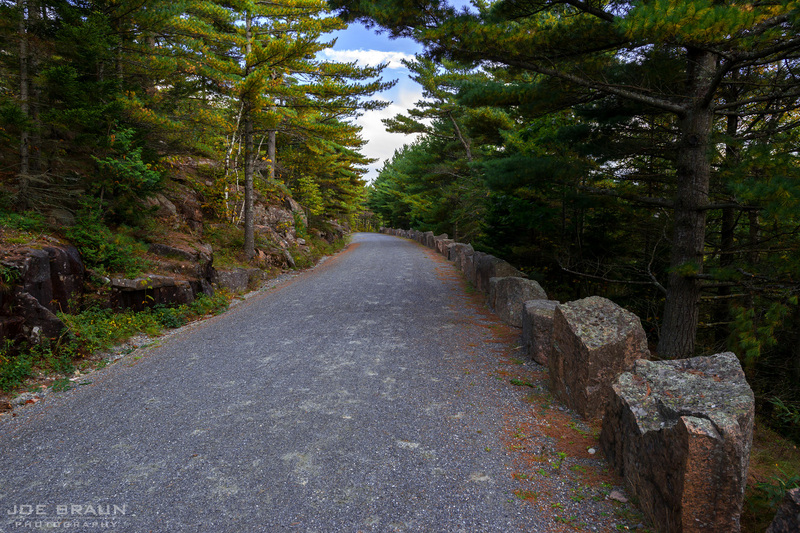 In spite of its relatively small land area, Acadia National Park has an amazing trail system with over 120 miles of trails beckoning for exploration. From family strolls along the rocky coastlines to strenuous and exposed scrambles to the tops of the majestic granite peaks, Acadia has something for everyone. The wonderful collection of trails exists because of so many people's passionate love of the scenery, including Waldron Bates (who was one of the pioneer trail designers of Acadia in the early 1900s) to the present-day Friends of Acadia, a non-profit organization that restores and maintains the trails. Hiking on Acadia's trails is a magical experience; they were designed to wander around and touch the most scenic spots of the area. Specific hikes are discussed on the following Recommended Hikes page and many more obscure options can be found on the Even More Hikes page. With so many intersecting trails, carriage roads, mountain peaks, lakes, shoreline, and historic bridges to explore, the hiking possibilities are wonderfully overwhelming. A trail map, such as the Map Adventures Acadia National Park Trail Map, is almost essential to prevent from getting lost in the maze of intersections. Trails are typically blazed by both Bates cairns (a unique style of rock cairns that has two feet) and aqua/blue painted markers on the granite slabs and sometimes trees. Most peak trails are typically easy to follow, but occasionally you may need to stop and look around a bit for a faded or lichen-covered marker. Footwear: While heavy hiking boots may be preferred by some, light hiking shoes like trail runners are perfect for the terrain in Acadia. (A simple shoe like the La Sportiva Akyra Trail Running Shoe works great.) Hiking sandals like the Keen Newport H2 are great for leisurely shorter hikes along the shore where your feet might get wet, but avoid any sandals that don't have any toe protection. Drinking Water: While many people get away with taking only a small bottled water with them on long hikes, it isn't recommended. Bringing water in Nalgene bottles or hydration reservoirs in a compatible backpack are both good solutions. 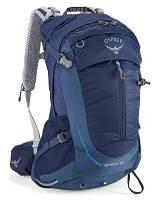 The Osprey Stratos 24 is a great little hydration-compatible backpack for day hikes and it still has quite a bit of room for supplies. Food/Snacks: For longer hikes, bring any food that helps keep you going, from energy bars to fruits and sandwiches. 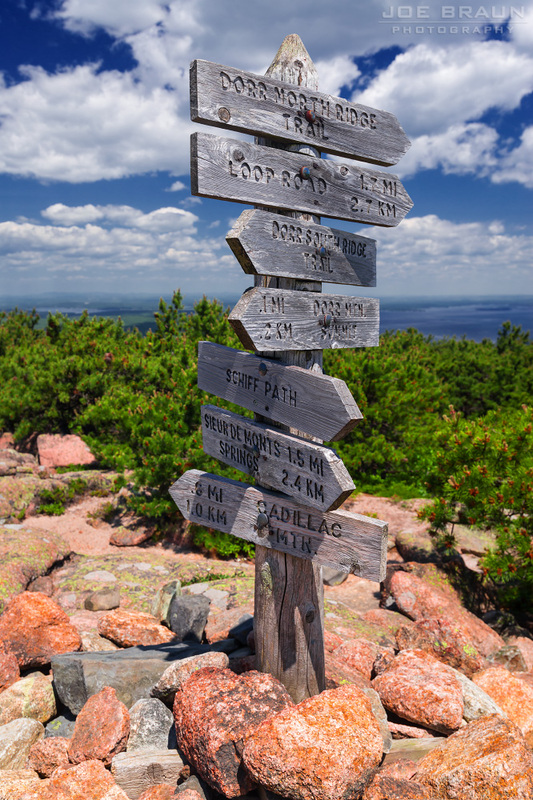 Navigation Aids: The Map Adventures Acadia National Park Trail Map is extremely useful for navigating the maze of trails and carriage roads. Headlamp: It's a good idea to bring a headlamp on day hikes as well as backpacking trips, just in case you get caught out after dark. 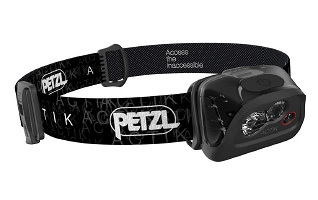 Two excellent lightweight models are the Petzl Actik (dual LEDs with settings up to 300 lumens) and the Black Diamond Cosmo 225 (dual buttons to turn on/off without having to cycle through different modes and IPX8 waterproof rating). For a more complete list of useful outdoor items, please see Hiking and Backpacking Gear. Pack out all garbage and don't take any rocks or other souvenirs, and don't pick any flowers. Do not build any new cairns or modify any existing cairns. Do not stack rocks along the trails, at viewpoints, or along the coastline. While the front-country has many trails-of-use that wander off the main trails, please obey any "do not hike here" signs and don't cross any roped-off restoration areas. Off-trail exploration is discouraged. Travel on durable surfaces such as established trails, rock, and gravel to minimize impact. Do not throw stones from the top of peaks or cliffs. Several areas are popular with climbers and a rock in the head could be fatal. 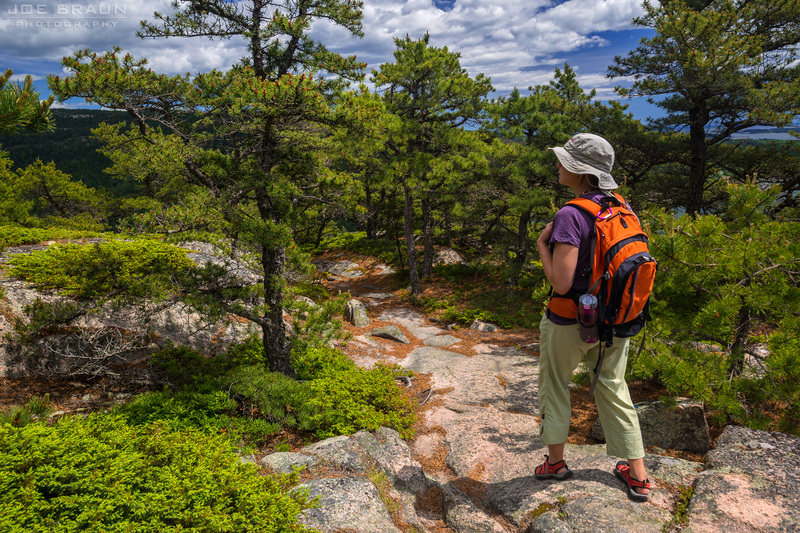 No backpacking is allowed along the trails of Acadia National Park. (Camping is permitted in designated campgrounds.) Since every stretch of trail is less than three hours from a road or trailhead, this shouldn't be a problem.